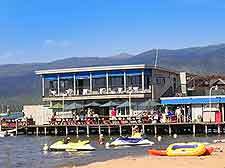 The choice of tourist attractions available around Lake Tahoe is very dependent upon the time of year that you choose to visit this part of California. In the summer months, boating and cruises around Lake Tahoe are on offer, with the Mississippi-style paddleboats being especially popular, while when the snow arrives in winter, the many ski resorts quickly fill up with tourists. 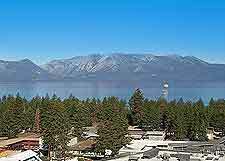 Located on the northwestern side of Lake Tahoe and close to the town of Truckee, Tahoe City contains a number of leading recreational attractions, such as river rafting, golfing, mountain biking, fishing and walking trails. 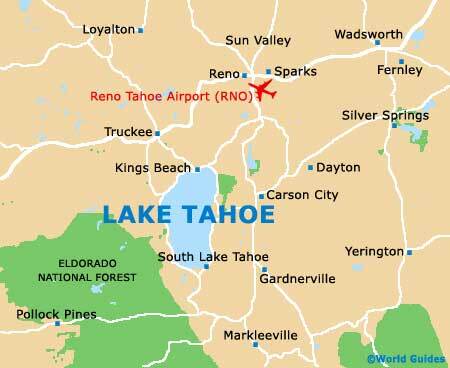 However, the busier and more lively town of South Lake Tahoe is really where the main tourist attractions are to be found, being heavily geared towards the tourism industry, home to the Heavenly Aerial Tram, and extremely close to the Nevada casinos in Stateline. 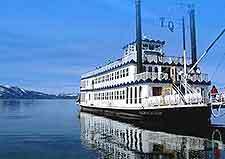 With Lake Tahoe being such a vast and beautiful lake, really one of the only way to properly explore its many appealing shoreline attractions is by climbing aboard one of the innumerable guided cruises. Boating and cruises are always very popular during the summer season, when a number of boating and sailing events are staged, often followed by dramatic fireworks displays, which are reflected and sparkle in the water's surface. A variety of different cruise packages are on offer, such as paddlewheel cruises on the huge 500-passenger Tahoe Queen, and the even bigger award-winning MS Dixie II, where dinner dances and sunset cruises provide the ultimate way to end a day's sightseeing. For something a little more intimate, yachts are available from Sail Woodwind at the Zephyr Cove, while Tahoe Sailing Charters may also be of interest, with its 11-meter / 25-foot sailboat taking in sights and attractions such as the historical Vikingsholm Castle, and stopping at peaceful spots to allow passengers to dive into the blue waters and go for a short swim. Since the state of California does not currently permit gambling, large numbers of glitzy casinos have now cropped all around the Nevada side of the lake, offering both slot machines and gaming tables, such as blackjack, roulette, poker and craps. 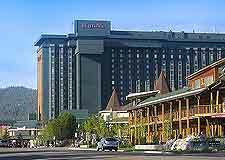 The majority of the biggest casinos have been built around the southeasterly shore, in the town of Stateline and just a short drive from South Lake Tahoe, where Harrah's, Harvey's, the Horizon Casino Resort and the MontBleu Resort Casino and Spa await. 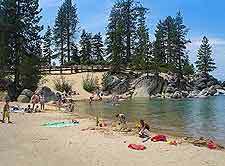 The north shore is also home to more than its fair share of casino attractions and gambling opportunities, which present themselves at locations such as Crystal Bay and also at Incline Village, where the Hyatt Regency Lake Tahoe Resort and Casino leads the field, where you are able to tempt 'Lady Luck' for 24 hours a day. For the ultimate way to view and travel around Lake Tahoe, do seriously consider a gentle hot-air balloon ride, which lasts for around three hours or thereabouts. Experienced balloon pilots will be only too happy to point of the various attractions as you rapidly climb to heights of up to 760 meters / 2,500 feet or more. Casual clothing and comfortable shoes is always sensible, although you should also bring a jacket, and of course, your camera. Shuttle buses are available for pickups, if required, with most ballooning adventures starting early in the morning, when the sun has just risen and the winds are at their calmest. Recreational attractions abound all around Lake Tahoe, ranging from guided hiking and rollerblading, to mountain biking and cycling. Bicycle rental is available at a number of outlets at the main resorts, where bikes can be hired by the hour, day or week. Around the lake itself are literally hundreds of different trails suitable for all abilities, ranging in both length and overall difficulty, often leading you through the very heart of the Sierra Nevada Mountains and its endless attractions. The most notable include the Tahoe Rim Trail (see below), along with those around the Desolation Wilderness, Eagle Falls, Emerald Bay and Granite Chief Wilderness areas. For those feeling brave enough, come to Kings Beach, where parasailing is on offer, taking you high about the lake shore and providing elevated views from a very different angle and perspective. The shoreline of Lake Tahoe is known for its extreme natural beauty and scattered around the coast are a number of extremely appealing beaches, which provide soft sand, launch spot or boats, and very desirable waterfront settings for a picnic. Especially noteworthy is the Sand Harbor, where a number of grand private residences and similar attractions reside, such as the Wattle Mansion. Each year at the end of July and start of August, the five-week Lake Tahoe Shakespeare Festival is staged at the Sand Harbor State Park. Close by, the Secret Harbor offers a very secluded setting and inviting beach, which has become extremely popular with nudists. Although the is a parking lot, it is quite a trek to reach the actual beach at the Secret Harbor, so make sure that you don't leave anything in your car. 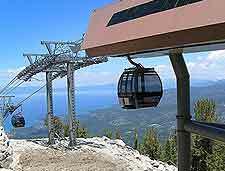 Few cable car rides come better than the Heavenly Aerial Tram, which climbs to 600 meters / 2,000 feet above Lake Tahoe and offers awesome vistas of the basin and beyond. When you reach the very top you will be greeted with a choice of hiking attractions, mountain biking trails, and even a mountaintop restaurant, offering fine dining with somewhat distracting views. During the snowy winter months, the Heavenly Aerial Tram provides a very scenic way to reach the acclaimed Heavenly Ski Resort and its selection of slopes. The High Camp can be found within the Squaw Valley, where it is often described as a mountain wonderland, boasting an array of seasonal attractions. Tourists will always enjoy riding the cable car and the resultant valley views, which at more than 2,400 meters / 7,875 feet high, stretch for many miles. Other favorites including mountain restaurants, natural waterfalls, islands, health spas, adventure sports and in the winter, skiing and ice skating is available. One of the most popular and remarkable hiking trails within this part of Nevada, the Tahoe Rim Trail at the Incline Village stretches for around 150 miles / 241 km in total, passing many natural attractions along the way, around the basin, including areas of both dense forest and wilderness, and plenty of native flora and fauna. 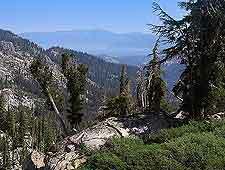 Panoramic views are plentiful, with superb vantage points from a high granite peaks and Mount Rose. Those wishing to hiking along the trail will first need to register at the trailhead's kiosk. In the summer months, guided hikes are provided free of charge. The Nifty 50 Trolley is a traditional San Francisco trolley bus, which regularly runs between California's Camp Richardson, all the way to the town of Stateline, in Nevada, making many stops en-route. Knowledgeable local guides provide insightful commentary and interesting facts about the numerous historical attractions that you will pass, stopping off at numerous locations, including shopping centers, Nevada casinos, and various beaches around the lake and in the Emerald Bay area. 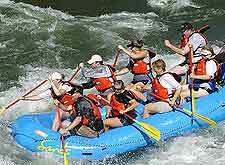 Based close to Tahoe City, Truckee River Rafting provides a very exciting way to spend a sunny afternoon. Up to ten passengers are transported along the Truckee River on this 5-mile / 8-km journey, onboard a professional inflatable raft (dinghy). Boat trips are particularly leisurely attractions and last somewhere between two and four hours, depending on how fast you choose to paddle. A return shuttle bus awaits ready for when you dock at the River Ranch, usually after you have enjoyed a picnic on the riverbank. One for visiting families with children who fancy some serious fun, the Tahoe Amusement Park is to be found within South Lake Tahoe and offers a number of colorful fairground attractions, including a small Ferris wheel. Also here is a carousel ride, an amusement arcade, go-karting, a huge slide and plenty of fast-food eateries, serving inexpensive hot snacks. However, it is the Roller Thunder roller coaster that draws the biggest crowds and on the busiest days, you will likely need to join a long queue for this popular ride. 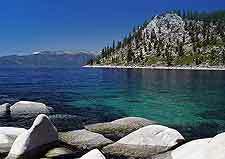 There are many good reasons to come to Lake Tahoe and sport fishing ranks particularly highly for many tourists. Some areas are 'catch and release' only, while others allow fishermen to take their catch away to eat, with a number of local restaurants being more than happy to cook your fish. The Mackinaw River is suitable for year-round fishing and is home to everything from salmon to Mackinaw trout. Guided fishing tours are available on the lake, particularly around the south shore, and trips lasting all day usually include lunch of some description. Whilst there are some huge fish beneath the water's surface, most catches tend to average roughly five pounds.